Houston, TEXAS (18 January 2017)., – Experiential travel boutique DreamMaker (www.HouseofDreamMaker.com) has designed a trip around the globe aboard a privately outfitted Boeing 767 for its ultra-high net worth clientele. Passport to 50 is styled as a milestone celebration for the billionaire client and up to 50 friends and family flying in tandem on a second Boeing Business Jet. Offered at $13,875,000, the unprecedented DreamMaker experience is slated for August 2017, covering 20 cities in 20 days. Passport to 50 is the first of its kind to completely circumnavigate the globe and cover 50,000 kilometers in the air. The trip includes a surprising time ratio of 88% on the ground and 12% in the air. “Since 1988, we have been setting benchmarks in the experiential travel space worldwide,” says founder and experience designer℠ Gregory Patrick. “In 2017, we will be the first to introduce Experiential Aviation℠ as the pinnacle of private aviation.” Highlights in the air include a $500,000 charity poker tournament with the world’s top-ranked poker player, inflight yoga session, a fashion show, and a Master Sommelier. Thinking far beyond flat beds, chef-inspired cuisine, and amenity kits, DreamMaker has appointed hypnotherapist April Norris to develop a holistic program that integrates cutting-edge wearable sleep technology with alternative wellness techniques such as hypnotherapy, Reiki healing, Ayurvedic medicine, and the attention of a Doctor of Acupuncture. “It is irrelevant how big and beautiful your private jet is if you are unable to relax comfortably or get the required amount of sleep on the plane,” says Patrick. To ensure the utmost comfort for its guests, Passport to 50 will boast a one-to-one ratio of guest to staff, with a cast of 50 hand-picked professionals, each experts in their respective fields. 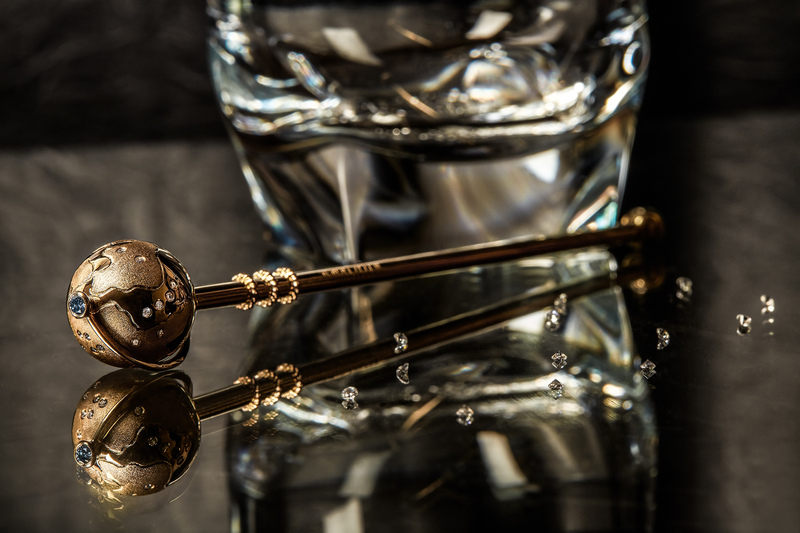 Partner World of Diamonds Group was commissioned to create the trip’s most luxurious amenity; a set of 18-karat gold swizzle sticks set with white and blue diamonds worth a total of $1 million. “DreamMaker’s commission demonstrates our expertise in creating spectacularly bespoke pieces out of fancy colored diamonds,” said Director Karan Tilani. Crafted into a spinning globe atop the 50 swizzle sticks are 20 white sparklers, each representing every city landing of Passport to 50. One rare fancy blue diamond, a specialty of the diamond mining conglomerate, evokes the blue skies traversed on this trip. In line with the 50 signature DreamMaker experiences, London’s Hotel 41 will be the first in the world to completely rebrand its identity to “Hotel 50” and accommodate the unique story with its famously personalized service. The hotel will chip out its marble tile in the foyer, commission newly monogrammed bed and bath linens, and a raise a “Hotel 50” flag. Other ground highlights include 50 monks’ blessings amidst an inundation of 50,000 lotus petals. The Passport to 50 experience directly benefits children around the world through Experiential Giving, such as the distribution of 2,500 bicycles to enable rural children in Cambodia to attend school, the provision of clean drinking water for 50,000 at-risk children in the Philippines, as well as building “fun centers” for 50,000 children battling life-threatening illnesses in the United Kingdom. “Through this trip, we have a way to act as a conduit to positively impact children’s lives,” says Patrick. “It makes no sense to work so hard to please the most discerning of clientele without making the same effort to balance the decadence with an element of kindness that delivers higher levels of fulfillment.” Charity partners include Water.org, Starlight Children’s Foundation, Make-A-Wish Foundation, and Whole Child International. Passport to 50 begins in Koh Samui and continues through Siem Reap, Kathmandu, Agra, Florence, Siena, Cannes, Moulinet, London, Barcelona, Ibiza, Marbella, Marrakech, Havana, Knoxville, Kona, El Nido, A Secret Island, before concluding in Manila. The trip is currently being offered at $13,875,000 for a party of up to 50 people in August of 2017. World of Diamonds Group is one of the largest privately held diamond mining corporations in the world. The Group is almost fully integrated in diamond mining, polishing, high jewelry creation, and distribution to leading houses of the world, providing fancy colored diamonds and jewelry to celebrities and members of royalty alike. Rooted in multiple layers of creative design for 28 years, DreamMaker is an experiential travel and event boutique that designs truly exceptional vacations for the ultra-affluent client who desires more than the requisite luxury. To qualify for a brochure for the Passport to 50 experience, please contact 1.800.WHY.DREAM? (1.800.949.3732) or email info@PassportTo50.com. For more details, please visit www.PassportTo50.com. For press queries, please call 1.281.783.8952 or press@PassportTo50.com. For more information on DreamMaker, please visit www.HouseofDreamMaker.com.